Headcrumbs Mod 1.13/1.12.2/1.11.2 – Celebrities heads as dungeon loot + heads for all the mobs you can think of! Vanilla heads -- All heads that you can get from vanilla minecraft! Twilight Forest Heads! -- All the heads that you can get from the mobs of the Twilight Forest mod! Natura and TE -- All the heads added from Natura and Thermal Expansion! Dungeon Loot heads! -- Can you name them all? Remember you can also add/remove any name you want using the config files! Lycanites -- All of lycanites mobs heads! mobs! -- They spawn at night but they don't burn during the day! 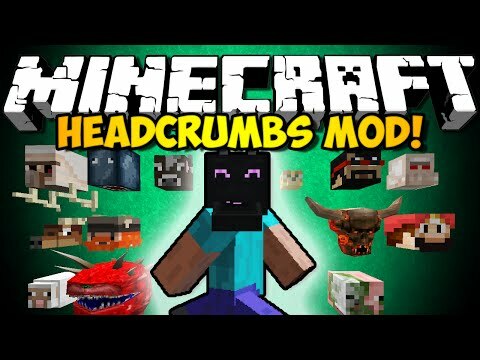 This is a simple tutorial that will helps you to install Headcrumbs Mod for Minecraft 1.13, 1.12.2 and others version successfully! Download the Headcrumbs Mod below or from anywhere, make sure the mod is compatible with the version of Forge installed. Place Headcrumbs into your Mods folder. If you don’t have one, create it now. Headcrumbs is created by ganymedes01, the mod was created on Jul 28, 2014 and the last update took place on Dec 7, 2018, so far is a total of 7,915,651 downloads. If you are interested in more information about Headcrumbs Mod, please go to CurseForge[link]. The Headcrumbs Mod download links from below are available for Minecraft's most popular versions so far, for others version (likes as 1.12.1 / 1.11.1 / 1.10.1 / 1.9.2 / 1.8.8 / 1.8.4 / 1.7.2 / 1.6.4 / 1.6.2 / 1.5.2 / 1.4.7) please visit the official website above! We do not host any Headcrumbs files on our website. We do not modify or edit the Headcrumbs in any way. If you have any problem with Headcrumbs Mod, please leave a comment below and we will help you as soon we can.